Signal today announced a new iOS 7 controller, the RP One, a Bluetooth gamepad with a traditional console-style design. Because it works wirelessly over Bluetooth, the RP One is able to connect to both iPhones and iPads running iOS 7. The RP One has been designed with serious gaming in mind, offering a "full scale" ergonomic shape to fit a range of hand sizes. The current prototype includes a directional pad, two analog sticks, two triggers, and four action buttons. Each RP One includes a universal stand for all of Apple's iOS devices, compatible with most covers and cases. The RP One controller offers up to 10 hours of battery life. The RP One most closely resembles the recently introduced SteelSeries Stratus, though it has a more promising design that mimics the popular Xbox controller. Early controllers from Logitech and MOGA connected via the iPhone's Lightning port, which excluded them from functioning with the iPad. Currently, multiple games like Dead Trigger 2, Asphalt 8: Airborne, and Bastion include iOS 7 controller support. Like the other iOS 7 controllers, the RP One will retail for $99.99. It is expected to be available during the first half of the year. Yeah, but give me a reason why these are more expensive. You're not getting anything extra alongside that extra $50. No nice aluminum build. No attractive Apple styling. They're just more expensive for the sake of being more expensive. Volume plays a large part in pricing. Imagine making something which costs $30 in parts, $10 in labour, and you want to make $10 profit. Charge $50, right? Not so fast. First, you have to design the product, which costs $10,000, in labour, parts, and tooling. Sell 10 controllers, and they cost $1050 each. Sell 10,000, and they cost $51 each. I just pulled those numbers out of my behind, but I hope it illustrates the reason prices start high and then drop, and why Wallmart will always charge less than a small store. What is it with iOS gaming controllers being so expensive? "What's with [insert peripheral name here] for Apple being so expensive?" Said by anyone who's ever owned an Apple device. because apple. thats their thing. This isn't Apple's product, nor are they dictating pricing. There are plenty of affordable and over priced accessories for every ecosystem out there. yeah the body style is more xbox but with the position of the d-pad i'd say it's more like a playstation controller honestly. which is great cause it's my preference to have both analog sticks on the same plane. It does, but a company shouldn't price its products based only on costs. youre right -- they should include profit on top of their costs. nice story but this isnt an apple product. nor are the other controllers. if all these companies are releasing products that you feel are too expensive, either one of two things: 1) stuff costs more than you think. 2) theyre charging too much, will feel the pain, and lower their prices. That would explain a new product that required a ton of R&D to put on store shelves. But these are bog standard bluetooth controllers that use a preset API to interface with apps designed for them on one specific platform. Most of the work is done by the app programmers, not the controller manufacturers. They're not blazing any new ground here, and shouldn't be spending $10,000 in labor to produce one. I could justify $60, but $100 is a little above and beyond. Personally, I believe it's licensing costs. Apple's charging a goodly chunk for accessories to carry that MFi logo. have you brought a retail good to market? i have. in an established product category, but that didnt alleviate the need to do a *lot* of work ourselves -- products dont design themselves. designers, electrical engineers, programmers, quality control, marketing....people dont work for free, each of this are one or more people, working for a salary to provide for their families. all this adds up. it's completely a matter of volume -- with few customers, things cost more. with many customers, we can discount and make it up on volume. for a new company w/ a new SKU (regardless of how old the category may be), it costs more. Because these controllers will probably start off with very low volumes so if they don't charge $99 they'd go out of business. 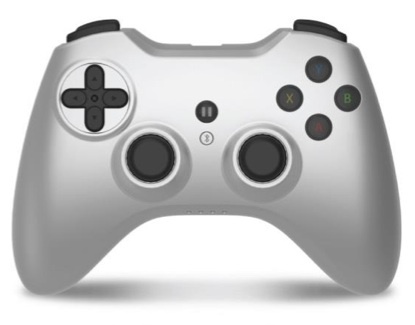 If & when these controllers become popular, they'll come down in price.